The Hershey Bears, in conjunction with the American Hockey League, have released the club's 76-game regular season schedule for the 2018-19 campaign. The new-look Bears open the season with a pair of home games at the Giant Center. Spencer Carbery, named the 26th head coach in franchise history on Jun. 26, will make his debut behind the bench in the home opener on Saturday, Oct. 6 at 7 p.m. as Hershey battles the Syracuse Crunch. The following evening, the Bears conclude the opening weekend by hosting Chris Bourque and the Bridgeport Sound Tigers on Sunday, Oct. 7 at 5 p.m. With Hershey's roster featuring a new look for the upcoming season, the opening weekend could feature the AHL debut of several high-end Washington Capitals prospects, including goaltender Ilya Samsonov, a 2015 1st round draft pick. Fans of the Chocolate and White will see a familiar, but new opponent at the Giant Center this season. With the Cleveland Monsters moving to the Eastern Conference, the club will play a pair of games in Hershey, as they visit the Bears on Friday, Nov. 16 and Saturday, Nov. 17. The two teams have not played since Cleveland, then known as the Lake Erie Monsters, upended the Bears in the 2016 Calder Cup Finals. The Bears will also visit Cleveland for a set of games on Mar. 23-24. For the second straight season, Hershey will play three Western Conference opponents. The Bears open 2019 by hosting a pair of unfamiliar adversaries when the Grand Rapids Griffins come to town on Saturday, Jan. 5, and the Milwaukee Admirals follow on Sunday, Jan. 6. The Rockford IceHogs will also visit Hershey, making the trip east on Saturday, Feb. 23. The Bears will also make the trek to the midwest early in the season, playing at Grand Rapids, Milwaukee, and Rockford on Oct. 12-14. These contests open a season-long seven game road trip in which the Bears also play a pair of games in Charlotte, and visit Wilkes-Barre/Scranton on two separate occasions. Conversely, Hershey's longest homestand on the schedule is just four games, an occasion that occurs both Feb. 9-16 and Mar. 13-19. Hershey's schedule features 12 games, including six on home ice, versus the Atlantic Division rival Lehigh Valley Phantoms and Wilkes-Barre/Scranton Penguins. Hershey's first face-off with its foes on home ice comes on back-to-back evenings when the Penguins make the trip down I-81 to Giant Center on Saturday, Oct. 27, and the Phantoms follow suit the next evening on Sunday, Oct. 28. The 2018-19 schedule features 10 "three in threes" where Hershey will play three games in three nights. This number is down from 11 last season, and 14 during 2016-17. The Bears busiest months are December and March which each feature 13 games. December is the Chocolate and White's most action-packed month on home ice with eight games at Giant Center in the last month of 2018. Hershey hosts the most home games on Saturday nights (19), while they'll also play home games on Tuesday (2), Wednesday (3), Friday (3), and Sunday (11). Home games will once again start at 7 p.m. on Tuesday, Wednesday, Friday, and Saturday nights, and at 5 p.m. on Sunday evenings. The lone exception is the Sunday, Feb. 3 game versus former Hershey head coach Troy Mann and the Belleville Senators. That contest will start at 2 p.m. due to the NFL championship game. The preseason schedule, Hershey's complete promotional schedule, and information on individual tickets for Hershey's 38-game home slate will be released later this summer. 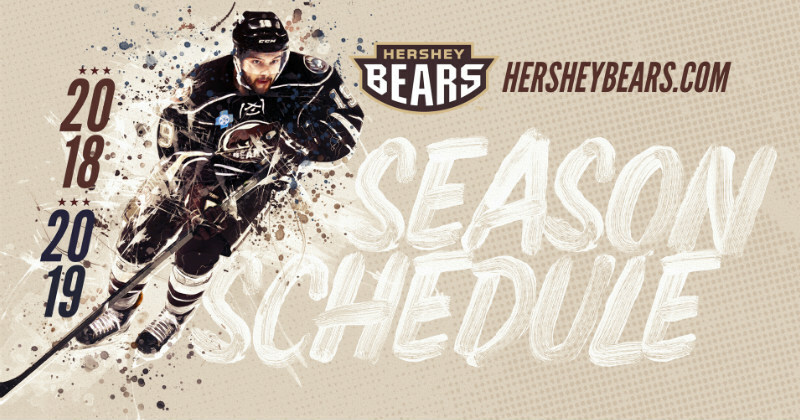 Information on full season tickets, 22-game and 12-game plans and flex-10 ticket plans for the 2018-2019 season is available by calling (717) 508-BEAR or by visiting HersheyBears.com. Flexible ticket plans start as low as $195 per seat.